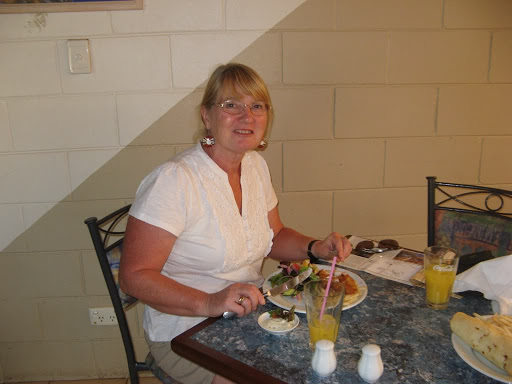 When we left Charles and Fred in Kununurra, we thought the trip home would be quick and uneventful, but we were wrong. Firstly it was over 3,000 kms which is a long drive, especially for an Oka, so it wasn't going to be quick. And then we were heading roughly due south so conditions were going to change just a tad along the way, and it had been raining everywhere south of where we were. Plus, dammit, we were still on holiday so what's the rush? So we planned a 2 week leisurely drive south and had to incorporate my birthday celebrations along the way. We came back via Katherine partly because we have developed a leak in our power steering box which loses about 300ml of fluid a day. It still works OK but we decided to stay on major roads for a while just in case (the hydraulic power also powers the brakes). It seems quite stable except for the fluid loss, which we are capturing for possible reuse if things get desperate. 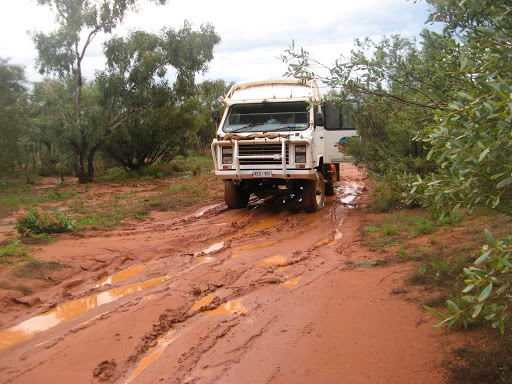 We were intending to come back across country but the Tanami Track was closed again due to rain, and we and the Oka are getting a bit tired after 3 months on the road, so it will be good to get back to terra firma again. 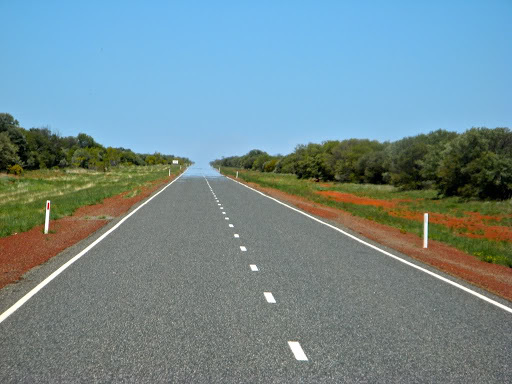 After the markets in Katherine we headed down the track towards Tennant Creek. 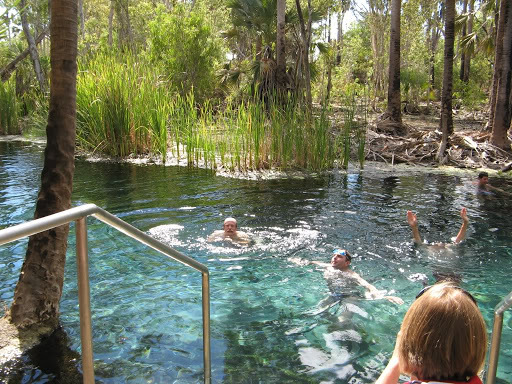 Just north of Mataranka are Bitter Springs, which are a series of natural, ultra clear warm water pools which make a delightful swimming place and would be refreshing, except that the water is at a constant 33º. They are not geothermally heated, that's just the average temperature in that part of the world. Further down is Gorrie Airfield a WW11 airstrip which is still in good condition. We drove up and down the main runway and around the taxiways which are eerily quite after 2 years of ultra-excitment in 1942/3. Another WW11 site is the a temporary hospital, set up MASH-style with tents, 2 nurses and 2 doctors in the middle of the scrub. It must have felt very strange and lonely (it still is) being so far from the action is such a quiet environment. 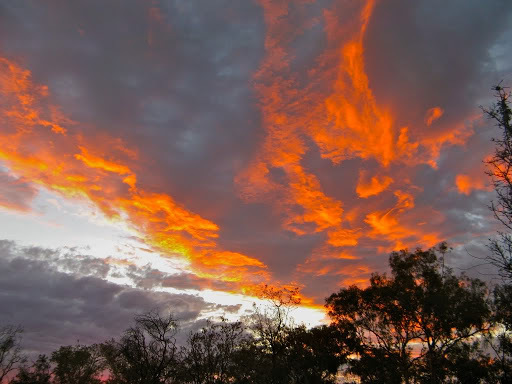 We camped there and witnessed some spectacular sunsets. Sunset at the WW11 Hospital Site. 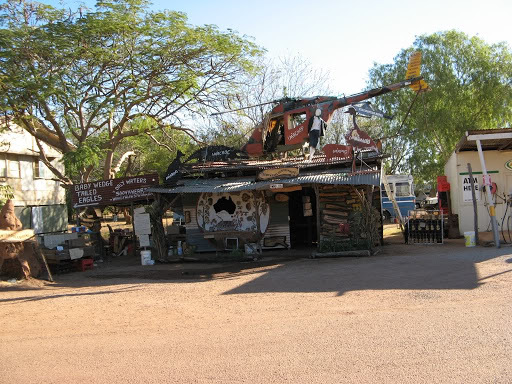 At Daly Waters everyone heads for the pub, which is an Aussie outback icon with it's quirky decorations and superb Beef and Barra entertainment. We stayed there on our last trip but this time we visited the little known Daly Waters International Airport (I kid you not). The airfield was built in the 1930 and was allegedly Australia's first international airport, used to support international air races and later a base for local and staging post for International airlines. 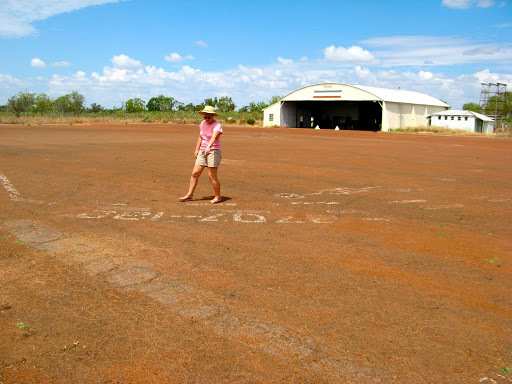 Daly Waters hangar and aircraft parking bays. We drove down the runway, as you do, pretending to be a wartime pilot. This a video of my drive down the runway. It will open in a new tab/window. 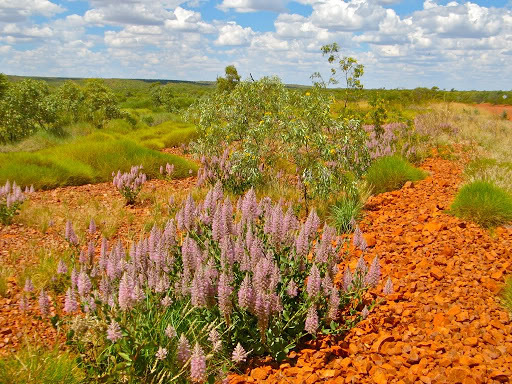 Just north ot Tennant Creek is a large reserve called The Pebbles. They are like a miniature set of Devils Marbles set in very pretty desert scenery. 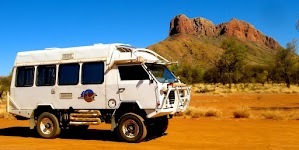 Naturally they are an aboriginal sacred site but access is reasonable and you can camp in there. 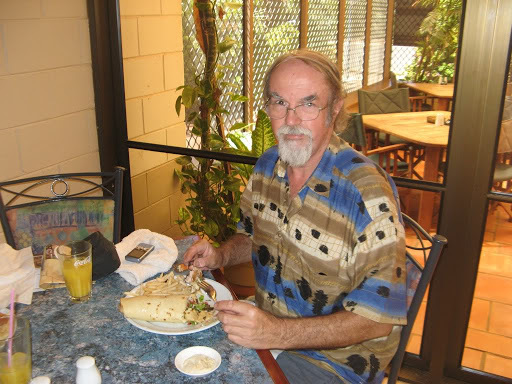 While in Tennant Creek I celebrated my 65th birthday with a Barra lunch at Fernandez Restaurant. 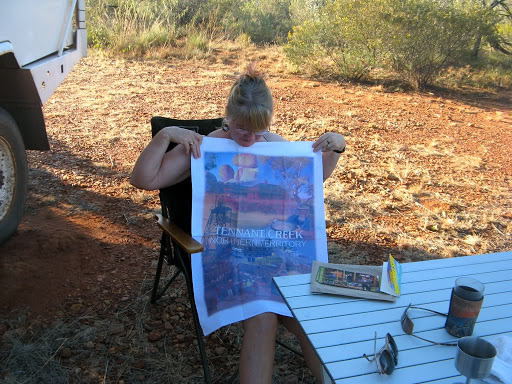 While I was bemoaning my fate, the lady at the Tourist Office presented me with a free birthday pressie, a Tennant Creek tea towel and some postcards. Janet is tastefully modelling my free tea towel. At Mary Anne Dam in Tennant Creek, our taxes (well yours actually) have been hard at work. 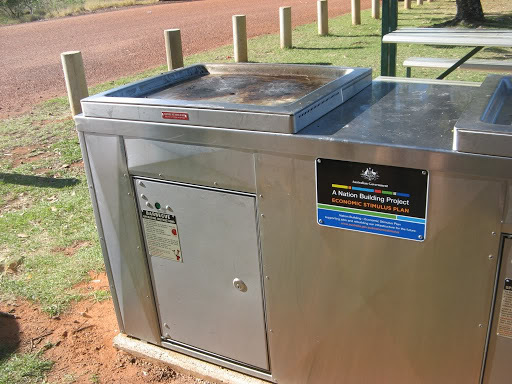 The Economic Stimulus program has funded some very nice stainless steel BBQs and shelters. Due to the winter rains this year, all along the roadside wild flowers are out in profusion. We stopped for lunch down a small track to enjoy them. Just before reaching the Devils Marbles, we came to the Davenport Ranges turn off and as we had a day or 2 to spare we side tracked a 100 km to the National Park. 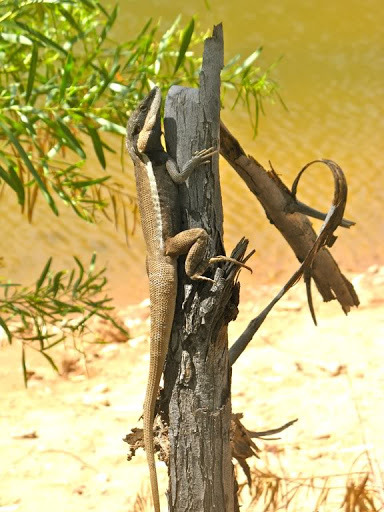 Alongside Kurundi Waterhole a lovely striped lizard sat and posed for us. 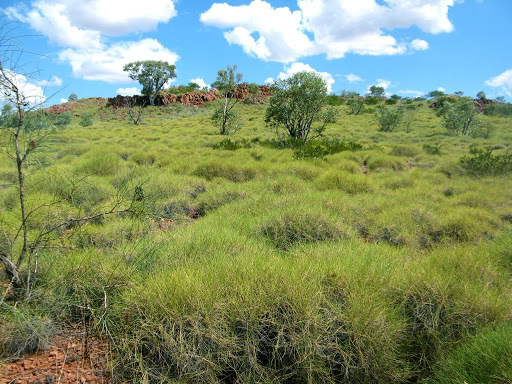 On the way to Whistleduck Creek in the Davenport ranges, the road passes through lush spinifex covered hillsides, which look soft enough to roll in, wearing a flak jacket of course. 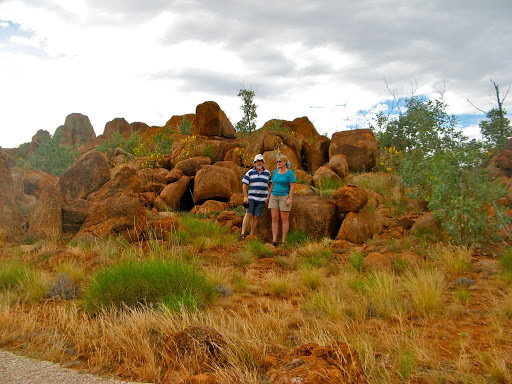 The Devils Marbles are a must-see along the Stuart Highway and a nice new camping are has been established. 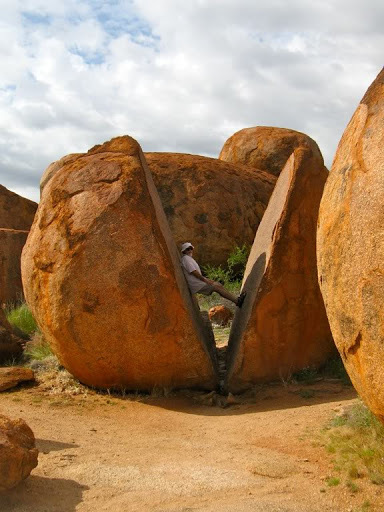 It's well worth a day or so wandering amongst the huge round boulders and playing silly buggers along the way. We stopped for lunch at Barrow Creek, famous for the sad Peter Falconio incident but also for it's Old Telegraph Station. In 1872 it had the phone on but in 2010 there is no mobile service. What's happening here? 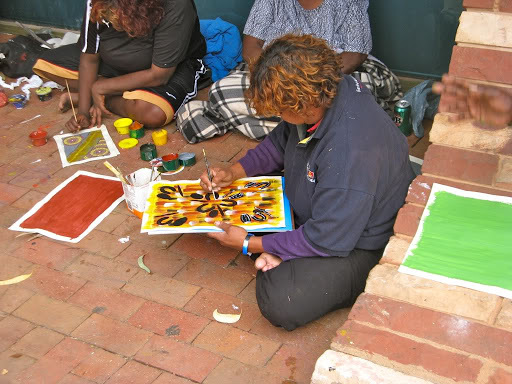 in Alice Springs there was a Desert Art Festival on, call DesArt. 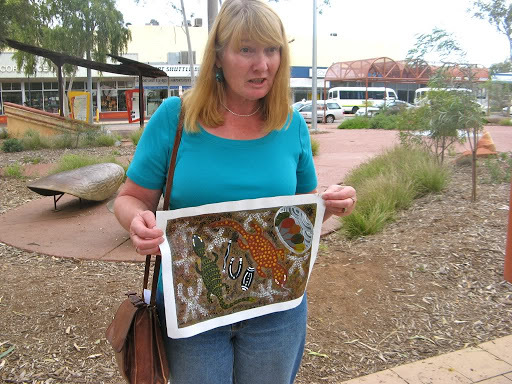 We bought a painting from an aboriginal family who had set up a small business outside the council offices. Kids would paint the backgrounds, mums would do the dot painting and dads would harass visitors into buying them. They were good value at $20 (3-4 times that in the Indigenous Art Shops which abound in the town).They were quite good quality and for an extra $2 you'd get the story behind the painting. 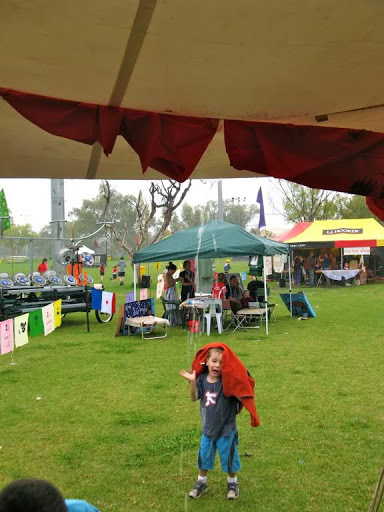 In the afternoon we went to a Kids Day at the festival where there were some amazing sound toys made of carefully tuned water pipes and old car wheels to bash with a hammer, and some good dancing displays, but it rained heavily which was to cause us some grief later on. 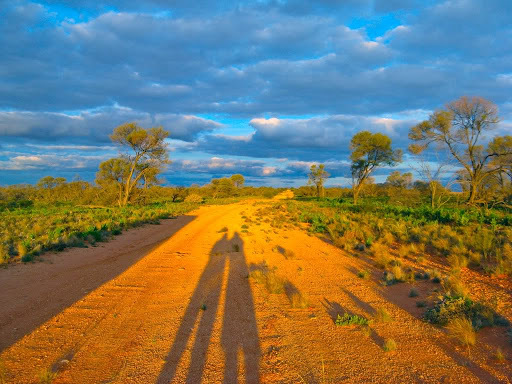 It doesn't often rain in the Alice in the winter but this has been a very different winter across the country with most outback tracks being badly affected. 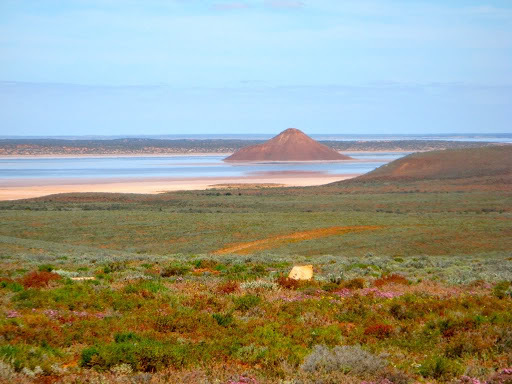 Even the Birdsville Races were cancelled. 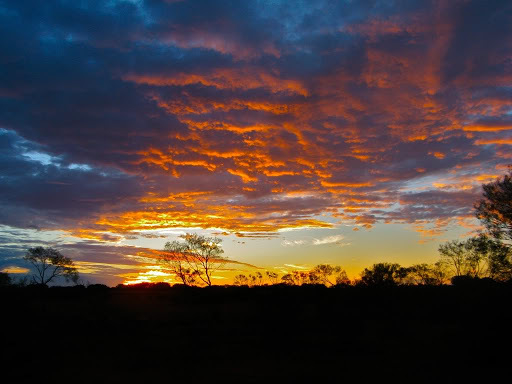 We returned to our usual camping spot alongside the old Ghan line just south of Alice Springs but the rain had softened the track. We had camped in the same spot the previous night with no trouble but when we went back the next night it all looked just the same except that rain had softened the surface. 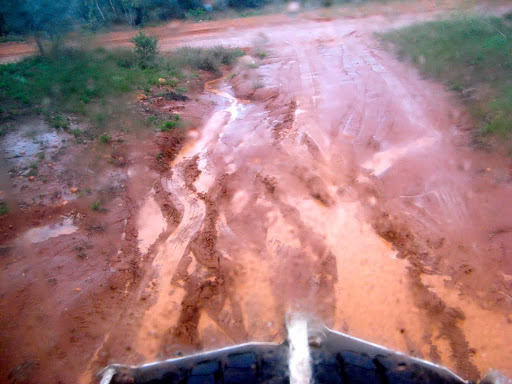 We went in about 20-30 metres and it then rained heavily for 1/2 hour and got very soft, so I let the tyres down and reversed almost all the way out. But the water had run down the side of the track and formed a drain which was very soft and the Oka just wanted to slide sideways that way so we stopped and stayed where we were until the next morning. If we'd slid into that drain, recovery would have been very much more difficult and expensive. We shouldn't have gone there but well, I'm only just human. We weren't far from the road but after heavy rain we couldn't safely back out. Interestingly, although we weren't going anywhere soon, we were in NextG phone range so we were able to keep family and friends aware of the situation in real time as the drama unfolded, and surf the net while we waited. As it was the next day was bright and sunny and the track had dried out, except of course for the 10 m we were stuck in. After a couple of hours of laying rocks and branches behind us, we just drove out with no more dramas. Patience is usually the best solution in this situation, rather than panic and make things worse. 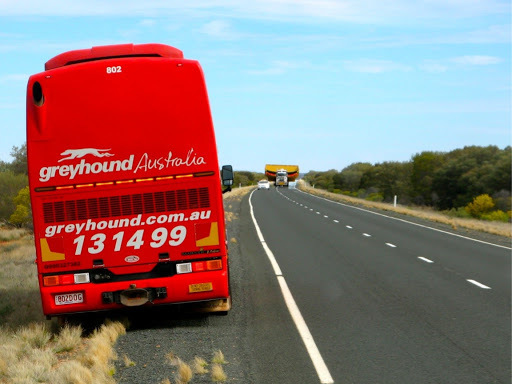 On the Stuart Highway south of Alice Springs we were overtaken by a fast moving Greyhound bus. About a km ahead of us it suddenly swerved off the road and we thought something had broken on it. The we saw flashing lights ahead and pulled off behind the bus. Presumably he had received a radio warning of what was coming. And what was coming were 2 huge bits of mining equipment, probably buckets for an enormous excavator or drag line machine. We had been hearing a vibration from the front wheels for some time so I stopped to investigate. One of the freewheeling hubs was locked even though it was in the "free" position. That was causing one drive shaft to rotate when it shouldn't. So we stopped at Cadney Homestead to fix it. I took it off and found one of the tangs holding it disengaged had broken off. So I rebuilt it out of the spare parts I had, refitted it and we were back on the road in 1/2 hour. Pretty good eh? But it was getting very cold now so Janet made a thick veggie soup for lunch, our first hot lunch for months. 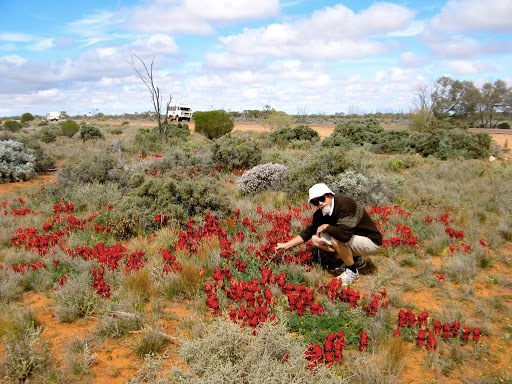 North of Glendambo, Sturt Desert Peas were in flower all along the road so we stopped for the inevitable photo ops. Lake Hart has always been one of our favourite areas just north of Pimba. We camped amongst the wild flowers and wandered down to the lake which is partly filled with water. 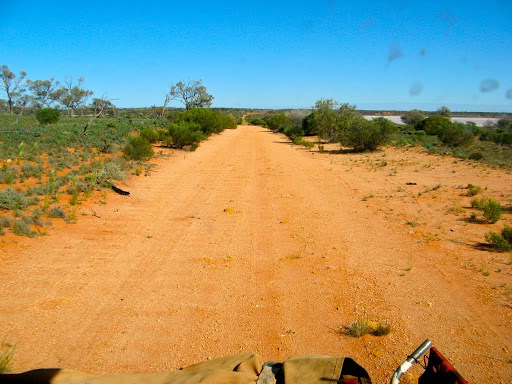 The Old Road to Alice Springs. Unused but still corrugated after 30 years. The very last campsite on our trip was at Clements Gap near Port Broughton. 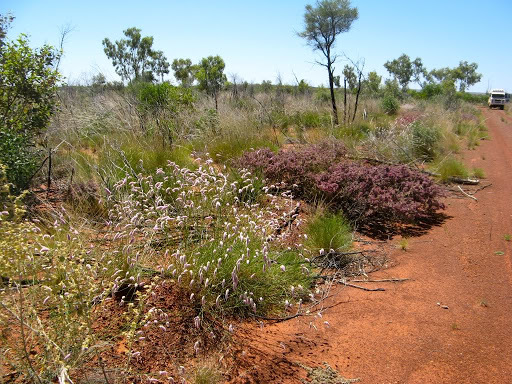 We had discivered this small conservation park several years ago. 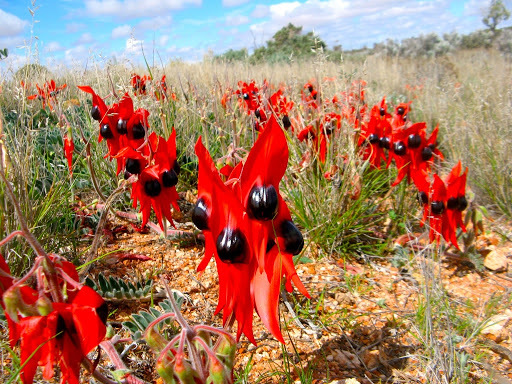 It's a small island of vegetation in a sea of arable farming paddocks but has some very pretty secluded camping spots. 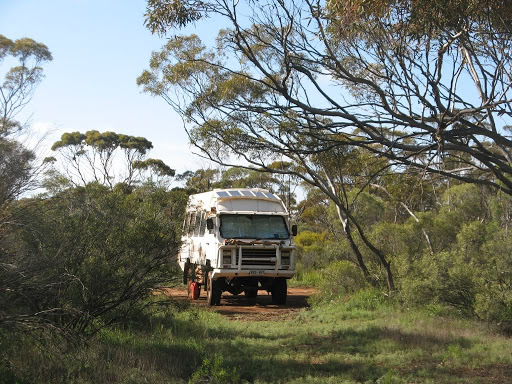 It's a handy camping spot quite near home and we always stay there when we first leave or return from our trips. So that was our trek for 2010. We are already starting to plan for next year. We have to go to New Zealand for a wedding in February and then we might do some more outback tracks in Western Australia later next year. In the meantime we have people to catch up with and rather a lot of gardening to do.